The return of the spectacular Dudley Group NHS Charity Neon 4k Colour Dash is set to be the biggest and brightest event we have ever seen! Get ready to meet our neon warriors who will cover you from head to toe in all neon colours as you pass through our throwing stations, culminating in a neon party at the finish line. With music and stalls on the day, the event is guaranteed to be fun for the whole family and a day to truly remember. So what are you waiting for? Register today and support our Neonatal Unit. We would love to hear about you blasting past these sponsorship targets, every penny raised will help us continue to provide vital support to our tiny patients and their families. By entering participants agree to raise the minimum sponsorship set out and to return this to the charity within three months of the event. By entering participants indemnify the organisers against liability for accidents, theft and/or damage to property and any third party claims. This event will not be timed. If you would like to time your run you must do so myself. Appropriate clothing must be worn. Please be aware that the powder should wash off, however we cannot guarantee this and advise wearing old clothing and trainers in case of staining. The powdered paint that we use is natural corn starch coloured will full tested food and cosmetic dyes. It is biodegradable, non-hazardous, non-toxic and fully tested. Whilst safe, we advise that the powder should not be inhaled and recommend covering your mouth whilst travelling through the colour stations and at the Colour Party. Personal accidents and third party insurance is not provided by the organisers. It is incumbent upon runners to provide their own insurance at their discretion. Marshals will be situated around the course and their instructions should be obeyed. Runners should be equipped for inclement weather. Any runner who retires from the run must inform the organisers. In the unlikely event of severe weather, the event will be postponed and held at a later date. 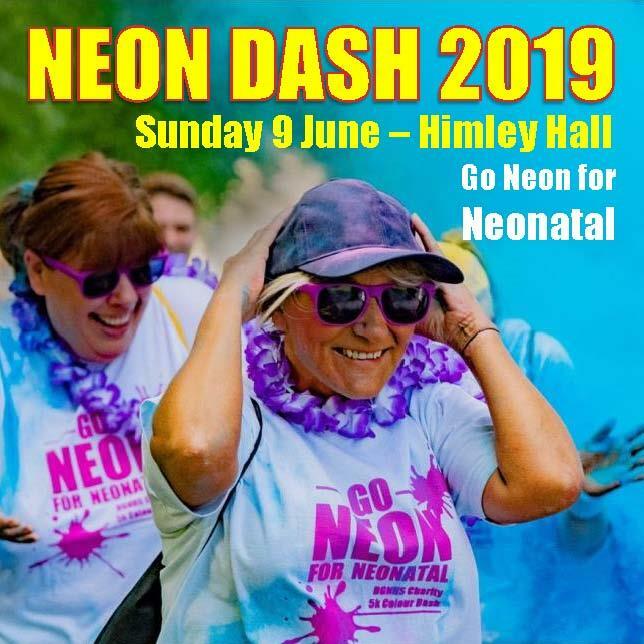 By registering, you agree to abide by the Neon Dash rules and will not hold the Dudley Group NHS Charity or any organisations involved in the event liable for any accident/injury or third party claim during or after the event. You also agree to raise the minimum amount of sponsorship set out by the charity and will strive to go above and beyond this. Early bird discount: If registering before Friday 26th April 2019, you will receive a discount of £2 per person. At such a worrying time for parents, knowing their vulnerable baby is getting the best possible treatment will give so much comfort. There are so many ways that your donations can make a huge difference. For example, in order to provide immobile tiny newborns the best care possible they require bedding that is similar to that of a nest. Babies that are born prematurely have very soft bones and have the inability to retain heat. Developmental positional gel packs mould to the shape of their body and fit snugly around them to provide soft and gentle support and helps to retain body heat.